How Secret is the Rapture? My friend and I enjoy talking anything about the Lord. We have so much in common in our love for Christ, but we’re very different in our doctrines — the Sabbath versus Sunday, the state of the dead, the character of God… quite a few, actually. I share my faith whenever the door opens, but I don’t force the issue. My main focus has been in building a trusting friendship, encouraging her faith in the Savior’s desire and power to heal the chain of health problems that plague her, and in discussing steps that she can take to improve her health. But one subject struck me as important enough to approach her more directly, simply because of the danger it presents to Christians: that of the Secret Rapture. Believing that you don’t need to prepare for the time of tribulation that’s upon us because you believe God is going to secretly whisk you away before it starts is, to me, a deadly snare of Satan. What’s going to happen to her when peace and safety are overtaken by “sudden destruction” (1 Thessalonians 5:3)? How is she going to overcome the temptation when Satan himself impersonates Christ, appearing as an angel of light (2 Corinthians 11:14)? If she doesn’t understand the true nature of Christ’s second coming, how can she avoid deception? And this is the purpose of this bookmark: to open up a conversation built upon our joint desire to see Jesus coming in majesty. Praise God, it’s almost here! Jesus promised that He will come again for us! (John 14:28) Picture this: an online video goes viral overnight while twitter feeds light up the cyber waves – #Jesus has Returned! The news media picks up the story and everyone is caught up in the excitement, or dread. We yearn for Christ to come back, but if we don’t know how He will come we may be deceived. Jesus Himself cautioned us (Matt 24:4-5). Even the Apostle Paul warned that “Satan himself is transformed into an angel of light” (2Co 11:14). We need to know the truth. 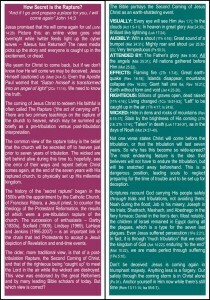 The coming of Jesus Christ to redeem His faithful is often called The Rapture (“the act of carrying off”). 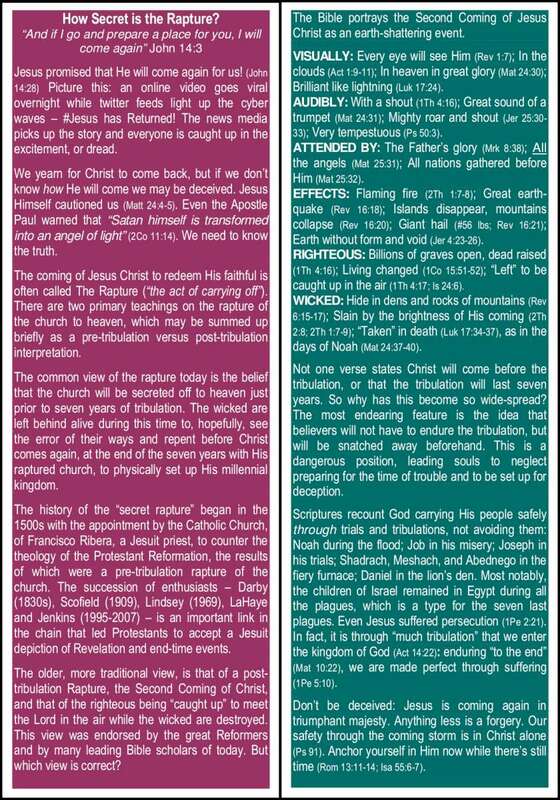 There are two primary teachings on the rapture of the church to heaven, which may be summed up briefly as a pre-tribulation versus post-tribulation interpretation. The common view of the rapture today is the belief that the church will be secreted off to heaven just prior to seven years of tribulation. The wicked are left behind alive during this time to, hopefully, see the error of their ways and repent before Christ comes again, at the end of the seven years, with the raptured church, to physically set up His millennial kingdom. The history of the “secret rapture” began in the 1500s with the appointment by the Catholic Church of Francisco Ribera, a Jesuit priest, to counter the theology of the Protestant Reformation, the results of which were a pre-tribulation rapture of the church. The succession of enthusiasts – Darby (1830s), Scofield (1909), Lindsey (1969), LaHaye and Jenkins (1995-2007) – is an important link in the chain that led Protestants to accept a Jesuit depiction of Revelation and end-time events. The older, more traditional view, is that of a post-tribulation Rapture, the Second Coming of Christ, and that of the righteous being “caught up” to meet the Lord in the air while the wicked are destroyed. This view was endorsed by the great Reformers and by many leading Bible scholars of today. But which view is correct? The Bible portrays the Second Coming of Jesus Christ as an earth-shattering event. VISUALLY: Every eye will see Him (Rev 1:7); In the clouds (Act 1:9-11); In heaven in great glory (Mat 24:30); Brilliant like lightning (Luk 17:24). AUDIBLY: With a shout (1Th 4:16); Great sound of a trumpet (Mat 24:31); Mighty roar and shout (Jer 25:30-33); Very tempestuous (Ps 50:3). ATTENDED BY: The Father’s glory (Mrk 8:38); All the angels (Mat 25:31); All nations gathered before Him (Mat 25:32). EFFECTS: Flaming fire (2Th 1:7-8); Great earth-quake (Rev 16:18); Islands disappear, mountains collapse (Rev 16:20); Giant hail (#56 lbs; Rev 16:21); Earth without form and void (Jer 4:23-26). RIGHTEOUS: Billions of graves open, dead raised (1Th 4:16); Living changed (1Co 15:51-52); “Left” to be caught up in the air (1Th 4:17; Is 24:6). WICKED: Hide in dens and rocks of mountains (Rev 6:15-17); Slain by the brightness of His coming (2Th 2:8; 2Th 1:7-9); “Taken” in death (Luk 17:34-37), as in the days of Noah (Mat 24:37-40). Not one verse states Christ will come before the tribulation, or that the tribulation will last seven years. So why has this become so wide-spread? The most endearing feature is the idea that believers will not have to endure the tribulation, but will be snatched away beforehand. This is a dangerous position, leading souls to neglect preparing for the time of trouble and to be set up for deception. 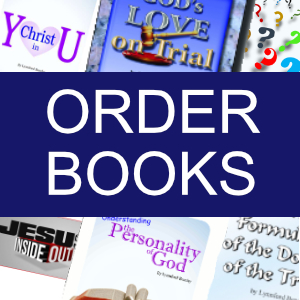 Scriptures recount God carrying His people safely through trials and tribulations, not avoiding them: Noah during the flood; Job in his misery; Joseph in his trials; Shadrach, Meshach, and Abednego in the fiery furnace; Daniel in the lion’s den. Most notably, the children of Israel remained in Egypt during all the plagues, which is a type for the seven last plagues. 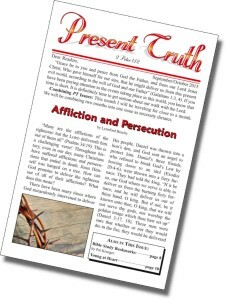 Even Jesus suffered persecution (1Pe 2:21). In fact, it is through “much tribulation” that we enter the kingdom of God (Act 14:22): enduring “to the end” (Mat 10:22), we are made perfect through suffering (1Pe 5:10). Don’t be deceived: Jesus is coming again in triumphant majesty. Anything less is a forgery. Our safety through the coming storm is in Christ alone (Ps 91). Anchor yourself in Him now while there’s still time (Rom 13:11-14; Isa 55:6-7).